This led me to find something different. I was searching for a paint that came in different sheens that would not require a top coat (and not stay tacky). Enter Benjamin Moore Advance. BM Advance is a Waterborne Alkyd Paint which acts and looks like a traditional oil-based paint in a waterborne formula that easily cleans up with just soap and water. I’ve read of people rolling, brushing and spraying this paint on and having great results with little texture (brush strokes, roll marks, etc.) I’ve used this paint 3 times now (I’m currently painting a third piece with it) and have only used the high gloss finish. I’m hoping to try the satin finish or semi-gloss as well, I just need to get more pieces prepped and ready for paint. 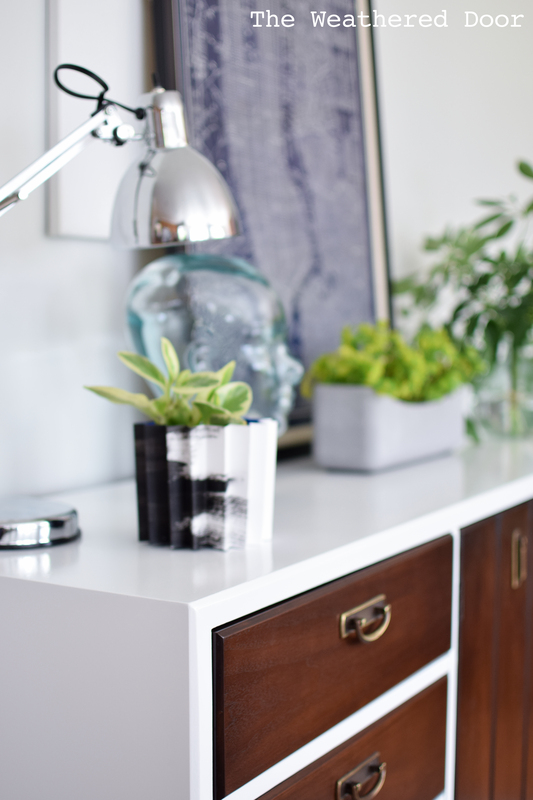 You can see the modern credenza with geometric drawers I painted with Advance here. Here’s my opinion on this paint, the good things about it, and the things I don’t care for. I will say, there’s no perfect paint out there. Different paints do different things and act differently. It all depends on the look you are going for and what you need the paint to do for you (like be durable on high traffic surfaces, or just cover an old finish). I want to start off with talking a bit about price. I find this paint to be similarly priced to other paints that I use (like General Finishes). BM Advance Waterborne Alkyd Paint will run you about $25 a quart plus tax and $50 a gallon plus tax. Obviously a gallon is more cost effective and it makes sense for me to buy common colors that I will use often (like white) in larger quantities. For colors that I’m trying for the first time or ones that are brighter and not used as often, I just purchase a quart. One thing to note about this paint is the dry time and re-coat time. It’s long, and people freak out about it. If you need a project done fast this may not be the paint to use on that project. The paint takes approximately 4 to 6 hours to dry and 16 hours before re-coating. Temperature and humidity can play a role in those times and can increase the dry and re-coat times. To be safe I wait at least 24 hours between coats and sometimes even wait 2-3 days if I can. I also use my dish heater (you won’t want to use a heater that blows air as this will cause any debris in the air to end up in your painted finish) and turn it on about 10 minutes after I finish spraying. My spray booth holds the heat well and I will move it about every 30 minutes or so to another area in the spray booth. Just be sure not to turn the temperature too high and do not put it too close to the piece. The great thing about the extended open time for Advance is it means that paint has a longer period of time to level which can result in a finish with fewer brush, roller or spray marks. I did still have problems with orange peel texture when spraying this paint sometimes. The negative to an extended dry time is more time for dust, fuzz and other debris to land in the finish. A clean space that will not be disturbed for a few hours is ideal. For me a fully controlled environment for spraying is not possible, but I do my best to keep my spray booth vacuumed, I lay down a wet or damp drop cloth to catch some of the overspray and other particles in the air, and once I finish spraying I leave the booth with as little disturbance to the plastic sheeting and try not enter again until the paint is dry. Another thing I’ve struggled with is applying the paint a little too thick on pieces with detail and molding, and then having it drip. This is partly due to the longer dry time, but this paint is known for now having great sag and drip resistance. Now that it has happened (and I’ve never had a drip when spraying any paint before using Advance) I changed how I painted doors and drawers with molding. Just be aware if you paint a piece with insets and molding, they can be tricky. If you get a drip with this paint you have to let the area cure for a few days (if it cures) and then use a high grit sandpaper (400 or higher) and lightly sand the area to smooth it out. Once you have done that go over it with 000 synthetic steel wool. In my experience it’s almost impossible to perfectly fix an area where a drip occurred without getting all the paint off in that area. I only ever got a drip when painting this piece. You must dull the surface between coats. I’ve been painting with the high gloss finish, and it’s glossy. If you do not dull the surface by using a high grit sandpaper or synthetic steel wool between coats you will not get good adhesion and the paint can repel the next layer that is applied. 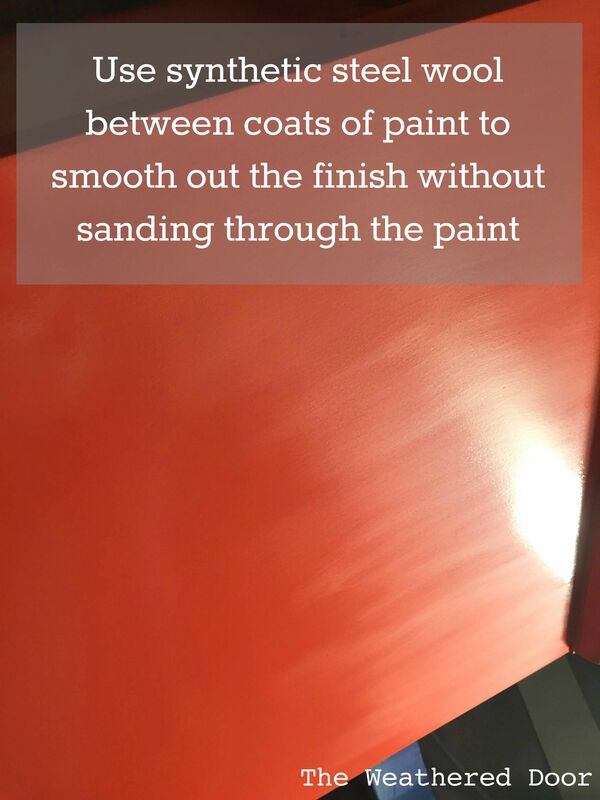 Even when working with other paints it is a good idea to smooth out the finish between coats to ensure a durable and smooth final finish. I don’t normally do this between every coat with other paints, but it is necessary with Advance. I’ve actually found that even high grit sandpaper, like 400 grit, will leave scratches in the paint (which will show through if you are using high gloss) so I solely stick to using #000 synthetic steel wool. The photo above shows the side of a piece that I had used synthetic steel wool on the dull the finish and smooth it out. In my experience real steel wood sheds and it can be hard and a pain to remove all of the particles from the piece. Plus, if you miss any particles there is a possibility they can rust and come through the freshly painted finish. None of the hardware stores in 30 miles of me carry synthetic steel wool (that I have found) so I order it off of Amazon. The Norton #000 2 pack is my favorite but I also buy and use the Task ‘Fine’ grit. Do not buy the the 3M brand. I tried it and it did nothing, don’t waste your money. The best thing about dulling the surface between coats with synthetic steel wool is it doesn’t remove much, if any at all, of the paint. When I used sandpaper and a sanding block it made a mess and would rub the paint off the edges of doors and drawers so I would be back down to the primer. Synthetic steel wool won’t do that! I only ever use sandpaper on with the paint if I get a drip. Any fine particles get removed and smoothed out with the synthetic steel wool. One thing I’ve loved is that Advance comes in multiple sheens/finishes. Like I mentioned at the beginning of this post I have only used the high gloss finish so far, but the paint is also available in satin and semi-gloss. For a non-oil-based paint the high gloss Advance has a really nice shine. When I spray it on it gets pretty glossy… and I don’t have to use an oil-based product which would mean terrible clean up and lots of fumes. It’s a great alternative to an oil-based product. Even though this paint acts like an oil-based paint, it is low VOC (no strong chemical smells) and it cleans up with soap and water. Score! One drawback to this paint being a waterborne alkyd is the cure time. The can reads 60 days for the most durable, fully cured finish. That’s a long time! I don’t know anyone who wants to do a project, like paint a piece of furniture, and then have to wait 2 months for it to cure and regularly using it. While it may take 30 -60 days for the paint to fully cure I have let a piece sit for 2 weeks before putting everything back together and staging (staging = wear around here). I’ve moved books around on it, set glass vases on the paint, heavy metal lamps, picture frames and other items without any marks, scratches or indentations. I even left items on overnight for 24-36 hours and still had no problems with only 2 weeks of curing. That being said I’ve had the opposite experience. I painted a piece that seemed like it cured but dinged and scratched way too easily. This was before the full 60 days of recommended cure time, but that shouldn’t happen to dry paint after 1 month. Like I said before, this paint isn’t for every project. I also assume (and have had people confirm) that a lower sheen like satin will cure faster. Semi-gloss and high gloss are more likely to stay tacky longer until they fully cure. In full disclosure I want to say that I have yet to paint a piece and use it for an extended period of time, so I cannot speak to the long term durability of this paint. I do plan to paint a piece to use and test out and will do an update in a few months on how the finish has held up and if any dents, scratches or anything else occurs. Since 2016 I no longer use BM Advance. Please click here to read why and my updated thoughts on the paint. 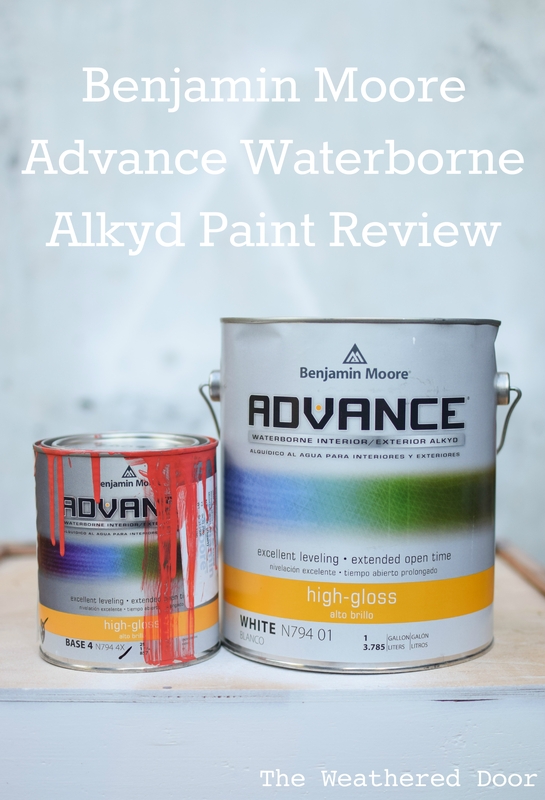 So there’s my little run-down of how this paint works and some of the advantages and drawbacks to a waterborne alkyd paint. If this scared you away or you want a product that does not require as much time I love using General Finishes milk paint, which is actually an acrylic paint, not a true milk paint. Their paint comes in one sheen (it’s a low sheen finish) and is best when sealed with their High performance topcoat which comes in Flat, Satin, Semi-Gloss and Gloss. I have been using GF paints and high performance topcoats for a couple of years now and they provide beautiful and durable finishes. If you have more questions about this paint leave a comment or shoot me an email: theweathereddoor[at]gmail.com. Have you tried BM Advance yet? I think we’d all love to hear your tips and experiences with this paint. I use Advance for the kitchen cabinets that I spray for clients (and I did my own back in 2011). I am a big fan of Advance overall, but feel your pain on the dry time and cure time. I will say that it hardens like an oil based paint once it has cured, and I'm really happy with that in terms of durability. And it levels out beautifully, which is great. Have you ever tried Breakthrough (by PPG)? It's dry time is insanely fast – dry to touch in 15 minutes, and I think the revolt time is 2 hours. Highly durable as well. The only downside is that I don't like the sheen as much as I do the Advance. It's all about trade-offs I guess! Jenny- if you get this- I have a question- how have your cabinets held up if bumped etc??? I am doing mine now and my sister asked. Can't wait to see your next piece, it's been awhile! Love your blog! Nice article Reeves. I've used the glossy numerous times, although I brush it. I just can't seem to get around to setting up my Earlex and making a booth! Although the brushing takes FOR-ever, it levels out beautifully. 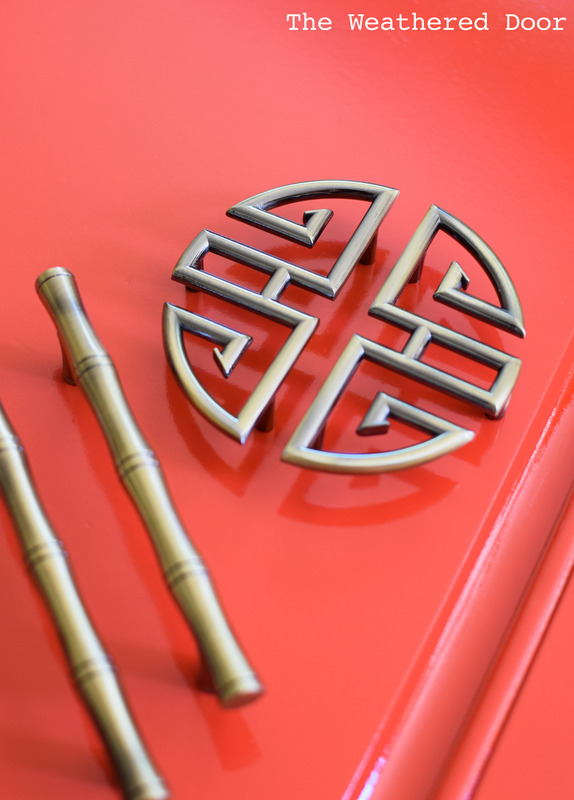 I'm just finishing a Stanley Asian style dresser and will be posting pics soon. As for you spraying the GF topcoat, have u researched the hw-tos on Paint Forum? I remember reading some tips from the guys. A lot had to do with tip size and adjusting the pressure on the compressor. They got into a lot of detail so if you're interested, head over there and research it. But I really think with this paint, it's not needed. Obviously with the GF milk paint, yes. I just use the wipe on urethane if I'm going that route. BTW, what color is that orange?? Have u finished that guy?? I’m having trouble understanding this long dry time people are complaining about. The paint “dries” quickly! You can record in an hour usually, and if I’m ever having to brush trim work usually by the time I make it back to my starting point the paint is mostly dry, still a bit tacky but I prefer to record it at this state because the second coat clings to it better, as if it has been wiped down with Wil Bond or a similar product. You have to wait the recommended time for it to dry. Otherwise, if you just put another coat on while the previous coat it tacky none of it will ever cure and it will always be that way. I agree that the paint isn’t all that it is made out to be. I have only tried the high gloss finish though. I really appreciate your post and advice on synthetic steel wool. I first tried BM Advance on my bath vanity and had good results, so I used it on my kitchen cabinets for applying white over laminate cherry stained wood. It turn out great after finally getting my prep technique down with sanding Zinsser BIN primer between coats and using the Synthetic Steel Wool on Advance. After taking such care in finishing my cabinets, I’m finding it difficult to keep that perfect finish with a Matte Polyurethane layer (using General Finishes High Endurance). My question is, two fold, would you recommend using the super fine synthetic steel wool on the final dry layer of Advance in Satin, and second, is Poly necessary with this paint, even with kitchen cabinets, or am I mucking up my finish needlessly? Thanks! Hi Steph, I am just one coat in on painting my cabinets with advance, I noticed you said you were doing primer between coats… does that help somehow? I used the benjamin moore primer that was recommended by the gal at the store and have one coat of paint so far. I did ask about a topcoat of poly and she said not to do anything on top of the paint. Sorry for the confusion, but I first primed my cabinets with Zinsser BIN primer and sanded in between those two coats. I didn’t add primer between painting with Advance. Between the Advance coats I dulled with synthetic steel wool, which I read is necessary for max adherence of paint. I didn’t like how poly looked over my beautiful paint job, so I resolved putting one layer of General Finishes High Endurance Matte Poly on the lower cabinets. Turned out great, now I’m just letting my cabinets cure before heavy usage. I ended up using at least 2 coats of Advance. Are you sure you used Advance? Advance doesn’t come in Pearl, but Regal does. Are you asking about a Glaze or Polly? I use GF High Endurance (Water based) Polly over Advance with no problem. I’m in Cali, where oil is not accessible. it sounds like if i can use a water based poly i can use an acrylic or water based glaze well? Yes pearl is the same is satin, but I’ve only ever heard of Regal having pearl in the USA. It might vary in other countries. Sorry, I’ve never glazed, but as long it’s not oil between water, I see no issue. Try asking the expert at the paint specialty store. Again, I’ve had no issue with putting a water based polly over waterborne Advance. They also make a oil based called impervo, which is not sold in my state. Did you add anything to the paint before you sprayed it? Some people say you need to add a little water or flutrol. I did thin with warm water. Has anyone used Benjamin Moore Advance to paint oak cabinets? If so, did the cabinets need prep before being painted? My concern is with the grooves that the grain makes…will they be noticeable when the light hits them a certain way? Hi Jayne, last summer I painted oak cabinets in a laundry room. They had the heavier oak grain. I rolled on 1 coat of primer and then sprayed on another. For the paint I used 2 coats of the BM Advance in Satin sprayed with an HVLP. For the most part the paint filled in some of the grain and minimized it. It’s hard to notice until you get with a few feet. I would use a satin or low sheen to help minimize the grain and highly recommend spraying the finish. Always prep! I used a cleaner to degrease and a deglosser and also sanded prior to primer and paint.